There is great beauty out there, and much of it is expressed through stunning art which oftentimes depicts scenes glimpsed only in our imaginations. We are happy to offer you a selection of some of the finest artwork around! We've put together quite the gallery so that you might select the ones you most desire for your decor. Of course, not all artwork is drawn solely from the realm of fantasy, so you'll find that our selection here is quite diverse. We've broken it up into various categories to make browsing it easier, but you'll find that whether you are browsing classical pieces in our Medieval and Renaissance Art section or the growing works of creative imagination in our Fantasy Art section, all of the pieces featured will have something in common, and that is detail. Rich color, fine lines, and stunning concepts make virtually all of our artwork pieces stellar accents in and of themselves, and the fact that they represent some of the finest artists, both past and present, only improves upon their worth! And of course, our art prints and artworks come in a variety of sizes, ranging from full-sized prints to hang on your walls to lovely little greeting cards and bookmarks, so that you can enjoy your favorite art on the go. So if you are looking for some stellar artwork to bring into your home, perhaps to spruce up your decor or just to celebrate your favorite painter, then your search is over, as we offer a growing selection of great works all waiting for you to peruse at your leisure here. Beautiful paintings and stunning works of art are not solely the province of historic artists and painters. Brilliant artists exist, even today, and their works are just as stunning as those who came before them. 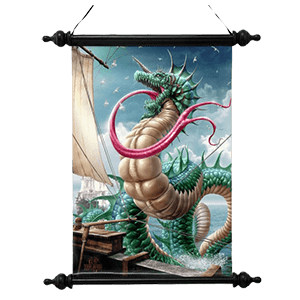 Of course, times are different now, and their styles, too, are different, but that variety is just what makes our fantasy art prints section so great! Here, you'll find a variety of pieces, many of which are based entirely on the realm of fantasy. These pictures, reproduction paintings, and prints, pioneered and put forth by modern-day artists, give us a glimpse of worlds beyond our imagination and reckoning. They depict things like powerful dragons and magical fairies, soaring the skies or dancing in the lost woods. They depict women of unparalleled beauty, possessed of sorcerous talent or vampiric features, as well as noble knights who fight demons and dragons with sword, shield, and spell. As wide as the world of fantasy is, so too is the variety that you shall find here in this section, which features works from the likes of artists as Anne Stokes, Nene Thomas, and so many more. Of course, they are all reproduction pieces, but that doesn't dampen their design, as each piece looks every bit as beautiful as an original! Some of our artworks are unframed, while others come framed, so make sure you read each description carefully and take note of the fine details found therein. The Fantasy Art you'll find here are so much more than just a touch of fantasy in your life. Each one is a stunning work of art, too, that can be admired as a stunning work on your wall. Best of all, you can get them here for a good price, too, making us perhaps one of the best fantasy art galleries you will find. 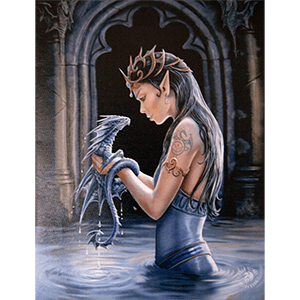 Ever since she was a child, artist Anne Stokes has loved the world of fantasy. 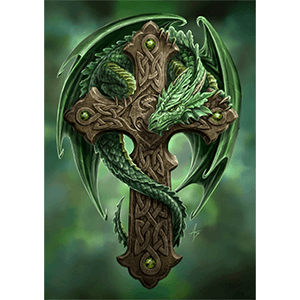 Possessed of a distinctive style and varied talent, Anne Stokes works are quite enjoyable, featuring a wide variety of influences. Now, you can see many of her works here. In fact, we have got a category that is filled with all of the Anne Stokes artwork that we carry in all its forms! This section is filled to the brim with all of our Anne Stokes pieces, ranging from full-scale art prints that recreate some of her beautiful and stunning artworks to more subdued decorations for sharing her works with others in your life, such as greeting cards for various events. Her works, featured here, include such classic staples of fantasy as dragon prints, angels, vampires, fairies, and even elf maidens, all featured in vibrant color and stunning detail. Prints range in size, and most come without a frame, although not all do, so read each item description carefully to see what they do and do not include. Our offered cards are smaller and allow you to easily share her stunning art with anyone you know, while also letting them know that you care. So if Anne Stokes happens to be one of your favorite artists, this section of her work is sure to quickly become your favorite section, thanks to its diverse selection of her stunning prints.